How dare Garrett Oliver make sweeping beer generalizations? Doesn’t he know that’s our job?!?! In this week’s Foodist column from Bon Appetit, Oliver notes that brewers “tend to hate [growlers]”. He goes on to explain that growlers are “beer destroyers” and he likens the purchase of a growler to someone scraping a plate of food from a nice restaurant into a bag, putting it in the fridge for three days, microwaving it, and then eating it. Mmm…appetizing! As is usually the case with Oliver, he actually does make some good points in the midst of his rant (in which he claims to speak for the entire brewing world, by the way). Yes, growlers are an imperfect vessel for storing beer. Yes, beer stored in a clear growler that is exposed to direct sunlight (even for a very short period of time) will skunk quickly. Yes, the filling of a growler injects oxygen into the beer which can negatively affect the flavor. These are valid points and I appreciate Mr. Oliver using his pulpit to explain to people that growlers are not meant for long-term storage of beer. A brewery will tell you to drink it within a day or two, but plans change. By the time you get around to actually drinking the beer, the chance that the growler will be anywhere close to as perfect as the brewer feels he was able to make it is pretty low. Look, I recognize that my social calendar probably isn’t quite as full as “the world’s foremost brewer”, but my plans really don’t change quite that dramatically. Unlike Brewmaster Oliver, I usually get around to drinking my beer roughly five minutes after I get home with my growler. I can say, with no hyperbole, that I’ve NEVER had beer left in a growler the next day. They aren’t things you really buy on a whim. When you buy a growler, it’s because you (and your friends, hopefully) have every intention of consuming that sucker within a few hours. A growler is a take-out container…nothing more. Like I said in an earlier post, you don’t get pizza delivered to your house with the intention of eating it a week later. You eat it that night (and sometimes for breakfast the next morning). So fine, Oliver is right that it’s unfair to complain about the flavor of beer in a three-day old growler, but what kind of person waits three goddamn days to drink a growler?!?! WHY did you even buy a growler if you didn’t plan on drinking it immediately?!?! Sigh…this story is a microcosm of most of Garrett Oliver’s interviews. He’s a supremely knowledgeble beer expert and nothing he says is truly false on the surface. But, as always, he can’t seem to sit down for an interview without making some pompous, preposterous claim. In this one, he makes statements about the way most people consume growlers that are just plain ridiculous. As he so often does, he treats the beer drinking populace like idiots. “You people…you’re always filling up growlers, letting them sit for a week, and then getting mad that your beer isn’t fresh.” No…we aren’t doing that. We’re drinking our growlers the day we purchase them and they taste just fine, thank you. As for his claim to speak for all brewers in his hatred of the 64-ounce vessels. Just take a look at the comments after the article to see how well that’s sitting with most Aleheads. Growlers are just fine, people. They’re like gremlins. Don’t expose them to sunlight. Drink them before midnight. Don’t pour water on them (not sure why you’d ever do that last one). If you follow those rules, everything else is cream cheese. Posted in Beer 101.Tagged Bon Appetit, Brooklyn, Garrett Oliver, Growlers. Does his target demographic even have cars and parking lots? The average proletarian who gets his growlers filled at Whole Foods in NYC (I’m talking to you, Czar Vladibeer S. Bootin’) probably shakes it for 6 blocks on the walk home…. in a brown paper bag…. Yes, newsflash, beer in growlers doesn’t last as long as beer that was bottled before being carbonated. What a revelation. One of you guys who has the Oxford Companion to Beer: What’s the “growler” entry like in there? Positive? Negative? Just curious. The part that gets me in the interview is his assertion that walking across the street with a clear growler (which nobody really uses anyway) will immediately ruin your beer. As I keep asking people, wouldn’t that mean it would be impossible to drink beer from a glass while standing outside without it being skunky beer? Or is there something I’m missing here? He should go talk to Scott Smith at East End and ask him how the Growler Shop is doing in the PIttsburgh Public Market. I bought 2 growlers while down there Saturday to share while myself and sickpuppy were brewing on Saturday. I don’t know anyone that sits on growlers for weeks. Every place I’ve been to which sells Growlers has said to drink it in the next 1-2 days. Hey Garrett, I’ll drink my beer and eat my reheated food the way I like. Kid, I can attest that in the strong summer sun of ‘Bama, a beer in a clear glass really CAN skunk in the time it takes for you to drink it. I’ve had a heavily-hopped IPA go from fresh to skunky in mere minutes in direct sunlight. Of course, in the Alabama heat, you beer will also go from cold to boiling in a heartbeat so you’re best bet for outdoor beer drinking is the ol’ “down in one” approach. I agree that I rarely see clear growlers. His claim that growlers skunk quickly is moot when you consider that almost EVERY brewery or brewpub that serves growlers uses dark brown glass. I haven’t read the G.O. 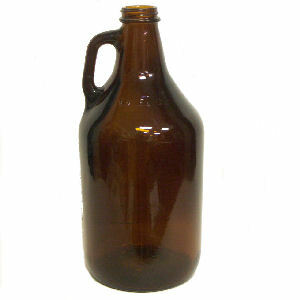 article you refer to, but given the spirit of your own post I will vote positively for Growlers. Agreed, G.O. is right on with the technical aspects concerning freshness and quality but all fresh foods have a definite shelf life and customers should be aware. Growlers keep the connection between the Brewery and the Patron fresh, even if there is a slight detriment to the beer. A ‘live’ concert doesn’t have the same sound quality of a finished production record, but ‘live’ shows cannot be matched note for note on having a good time. Thanks for the comment, Dylan. Always happy to see a pro brewer post his thoughts. Fellow aleheads–Mosley is the brewer at The Civil Life in St. Louis. I actually really dig Dylan’s analogy of growlers as a “live album”. I’ve never thought of it in those terms before, but bottled/canned beer really is like the “studio” version of an album. It’s more consistent and you know all of the “i’s” have been dotted and “t’s” crossed. BUT, a draft offering is so much closer to what the brewer really wanted you to taste (just like a live album can bring you even closer to what the musician was trying to say with his or her music). It may be a little more problematic, or rougher around the edges when you buy a growler. But it can also be a far more interesting drinking experience. So if bottles/cans are studio albums, and growlers are live albums, I suppose an actual concert experience would be akin to visiting the taproom and drinking a few feet away from the fermenters. I’ve heard some brewers are filling corney kegs for those with kegerators at home… is that like the old MTV show where Metallica comes over and plays Enter Sandman for you in the den? I think that was Wayne’s World. OK, here is my uneducated suggestion… how about the collapsible plastic containers that NASA and ..well even campers use for water or other liquids… you can place a o-ring one way valve like an air mattress uses for the fill into the air free, collapsible vessel. The vessel fill be brown or green for preservation from the light. Maybe a nitrogen grenade for later depending on the brew? An attached carrying handle and off you go! There, problem, solution…and cheap! Jesus Christ, the more I hear about this Garrett Oliver character, the less I want to hang out and have a beer with him. Can’t anything about beer be fun for this guy? I can’t really add to anything else that’s already been said here, for once I’m at a loss for words! Well said rant Brother Barley, Sickpuppy approved! I know what you mean, Rob. It’s like you can’t actually imagine Oliver DRINKING a beer. He’d be afraid of getting some on his suit or scarf. Well said. I’ll take my growler and my excuse to drink my beer in a timely fashion. Getting beer on his scarf?